of screw revolution sccording to the decline of resin temperature. 3. It is possible to make out put with less termal transformation due to shortening of staying time of barrel acc ording to the increase of revolution. 4. The breadth of resin is of wide application due to the temperature zone of resin working. optium screw array on spline shaft which can be transferable to high torque. Combination complying with the object is applied equally with screw. L/D and rent position can be changed freely in accordance with the use. Standerd quality of a tool steel and can be applird by special steel. distributing powerful conveyance torque of specialstructure. The combination of multistage thrustbearing is durable mechanism as a form of load division. Compaared with previous the same bore, driving torque is about one and half times. The cantilever type of rotary blade makes it easy handling of blade in case of regrinding. It makes the adjusting the clearance of blade and the cleaning easy, too. 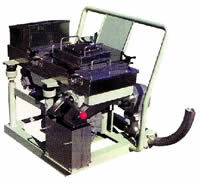 The machine is allowed to use for both soft and rigid plastics, but more effective for soft plastics. 2. Fewer splash of pellet to our side. 3. This made the lowering of noise. 4. No tangle or bounce strand. 6. Durable and easy mantenance. 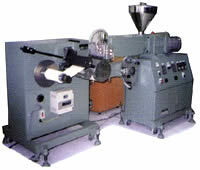 The sheet manufacturing equipment is a combination of their high output extruder and exellent die making techniques, therefore, is adaptable for a wide range of thermoplastics materials is, i.e., ABS,PP,PE, PVC and many more. 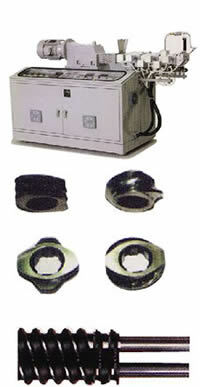 Bubble-on-sheet packing materials are manufuctured on this equipment continuously and quite economically.